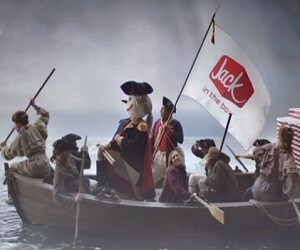 HP: “On one fateful day, Jack made a Declaration of Delicious with the all-new Double Jack. He and his crew were devoted to forming a more perfect union between 100% beef, cheese, and mouth. Because everyone deserves a history-making burger”. In the battle of the burgers, one man made a declaration of delicious: Jack. He set forth art with a generic no one saw coming. He was determined to bring great taste to this great nation in the name of life, liberty and the pursuit of flavour for all, so that everyone could taste history-making burgers. And America ate it up. True story. With fresher and tastier ingredients, we’re making every burger better, like the new Double Jack.